Buy this book! It’s gorgeous! Like most first time quiltmakers, when I first began making a quilt—one summer vacation as a teenager—I turned to tried and true traditional patterns. But beginning with that first quilt, a sampler based on one of those early 1980s books on how to make a sampler quilt, I took these old patterns and did what I could to make them my own. I adapted Squares in squares, Split Nine Patches, Chinese Coins, Crossed Canoes, and perhaps my very favorite: Jacob’s Ladder. Each quilt shares a long lineage with the many quilts that came before it, and helps usher in the many that will come after. I love that Michele Muska’s new book, Quilting the New Classics helps make those connections among quilts for us. Most books about making quilts don’t attempt to cross the supposed divisions between “traditional” and “modern” quilting, let alone art quilts and antiques. But we get all of the above from Michele, in part, I think because she is an individual that transcends these groups as well. Whether we’re traditionalists or modernists, curators, scholars, artists, quilters, or crafters, we all love Michele. I personally thank Michele for inviting me to contribute a forward to her new book. 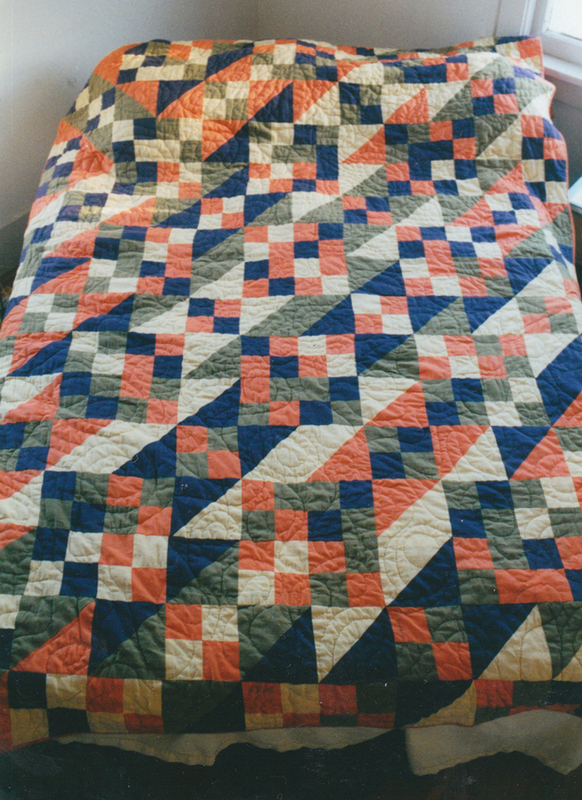 My second quilt, a variation of Jacob’s Ladder. A little proto-Modern, no? Displayed how I prefer my quilts: on a bed. 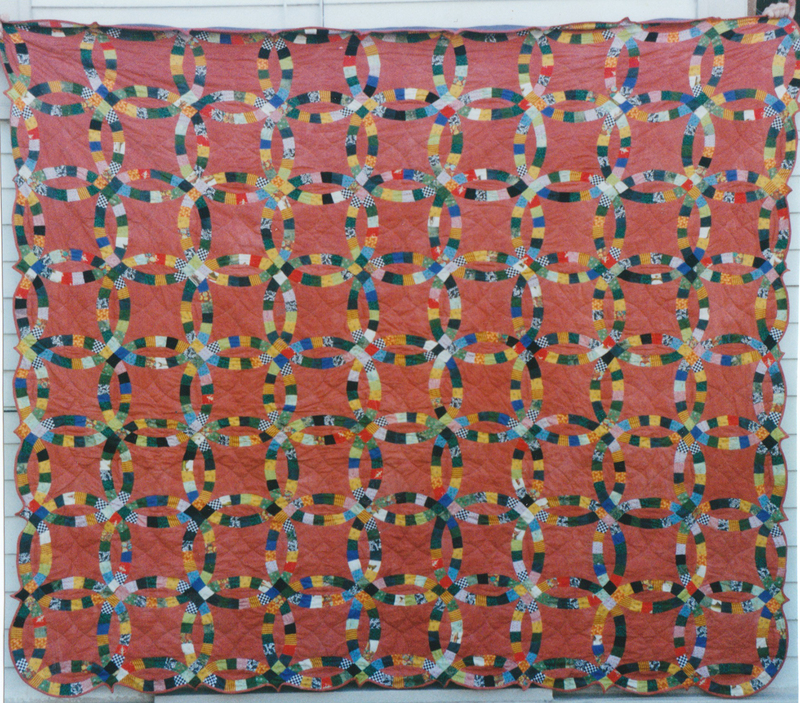 This one I set up in a big quilt frame in my college house my senior year. I encouraged friends to take some stitches, but sometimes had to pull them out after they left the quilting frame. Dated 1998. As I flip through Quilting the New Classics, I’m reminded of my own connections to some of these patterns, and how the quilts I know and love relate to this grander tradition that continues to be alive and thriving today. I had no idea how dang hard this would be! Double Wedding Ring for Steve and Krista Yutzy-Burkey, dated 1999. Out of love, but perhaps foolishly, I made a queen size double wedding ring quilt for my first two dear friends that married each other. Bad precedent. And a blanket apology to all friends who’ve gotten hitched since and have not received one. 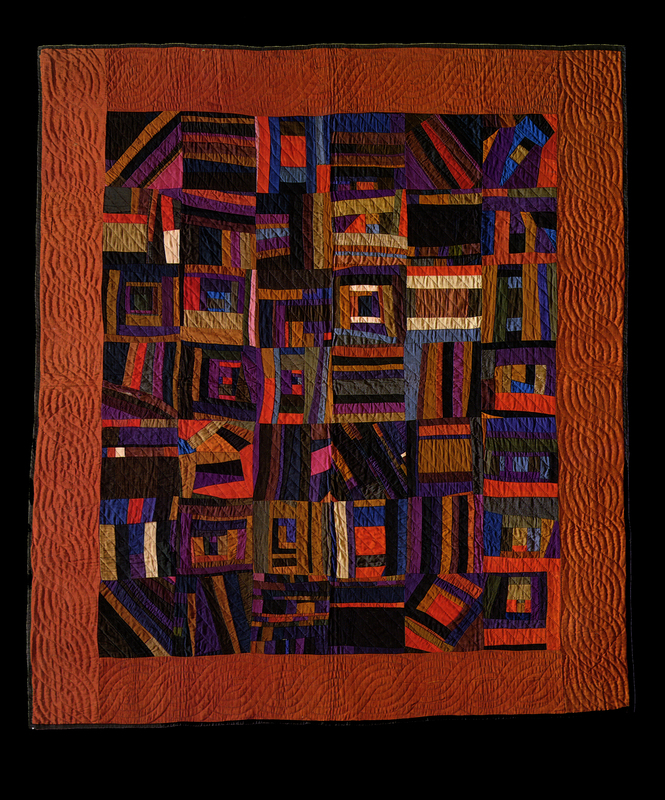 I am most drawn to the Amish version of crazy quilts, particularly the wild ones made by women from Arthur, Illinois, early in the 20th century. They may not have embellished like Allie Aller, but they went over the top in their own ways. Lately, when I think of the Bear Paw pattern, I picture little Selina, the Mennonite heroine of Selina and the Bear Paw Quilt, which has become a bedtime favorite among the four-year-old-set at my house. Civil War era Selina takes a Bear Paw quilt top pieced by her grandmother with her when her family moves to Canada to avoid the coming war. Although Bonnie Bus’s amazing nine patch she titled Oscillation (Quilting the New Classics, page 86) may be my new favorite, I also think of the nine patch in strips quilt I wrote a paper about in grad school from the collection of the International Quilt Study Center & Musuem—my first in-depth analysis of a quilt. Detail, Grandmother’s Flower Garden, by my Great-Grandmother Mary Hostetler Beechy, c. 1950. Fussy! Fussy! 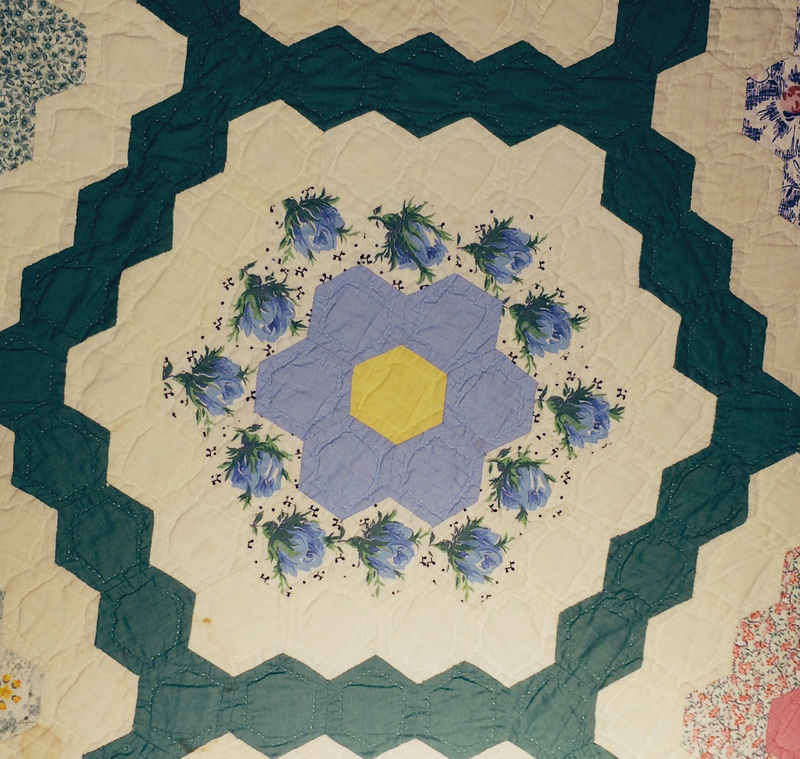 While Hexagon quilts predate the Grandmother’s Flower Garden quilt we all know and well, that is still the version I’m most drawn to, specifically the one often on a guest bed at my parents’ home, made by my great-grandmother Mary Hostetler Beechy, with the most ridiculous fussy cutting imaginable. My family did not, however, make Yo-Yo quilts. Prior to knowing Michele and her passion for Yo-Yos, I tended to question the sanity of anyone who might make such a quilt. I did however, fall in love with Roderick Kiracofe’s Yo-Yo quilt featured in his new Unconventional and Unexpected, with Yo upon Yo stitched on a huge sheet, with beautiful surprising appliquéd flowers peaking through. Rail Fence was one of the patterns in that sampler quilt book I started with many years ago. A very humble block in this pattern graces that quilt first quilt, which I still sleep under every night, even though Mark Lipinski told me I needed to stop and save it for my daughter. Sorry, Mark. And sorry, Calla. Also, stay tuned for some great inspiration and ideas from some of our contributors’ newsletters and social media platforms! And more from Marci Elmer Warren, Linda Pumphrey, Bonnie Bus and Darlene Zimmerman!